Notes: This review was written in the mid-1990s and based on the old Streamline Pictures release. Lupin and Jigen have just pulled off another million-dollar heist -- only to find out that all one million dollars of it are counterfeit money from Cagliostro! Cagliostro has supplied the world with counterfeit money of all nationalities for decades, only surviving because of the global economy's strong dependence on the faux dough. Shortly after crossing Cagliostro's borders, Lupin encounters the lovely princess of Cagliostro, hotly pursued by the Duke of Cagliostro's cronies -- and loses her to the Duke's men who imprison her in his heavily-fortified castle. A bit of inquiry reveals that the Duke has plans to marry the princess against her wishes...and perhaps other plans as well, one involving finding a priceless treasure lost for centuries. A beautiful damsel in distress, an evil Count to be smote, a lost treasure, and the biggest counterfeiting racket on the face of the earth...this is an order just too big for Lupin to resist! But it will take the combined effort of Lupin and all of his friends -- Jigen, Goemon, Fujiko, the courageous and selfless Princess herself, and even the relentless Inspector Zenigata -- to thwart the Duke's plans and save the day! Excitement and mayhem are in store! 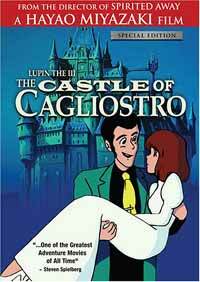 The Castle of Cagliostro has often been deemed one of the great classics in all of Japanese animation. Perhaps it's because of the exciting non-stop, creative action that usually comes with a Lupin III movie. Or perhaps it's because of the beautiful cinematography of anime-giant Hayao Miyazaki, whose story-telling skills are probably second to none. Either way, The Castle of Cagliostro is a sure-fire winner that will easily please both the hard-core anime fan and the green newbie. In typical Miyazaki fashion, the art and animation are something to behold. Because of the natural coarseness of Lupin III fare, the animation may have taken a back seat to some of the other aspects of this film, but it's still easily head-and-shoulders above most of what's out there. Beautiful backgrounds, truly sinister-looking villains, bizarre aircraft, and a real charmer of a princess will make those in the know smile, nod, and say, "Yup, that's Miyazaki all right." The soundtrack is exact in fitting the mood of each scene, and when the Lupin III theme begins to play near the beginning, you'll want to stand up and cheer. Miyazaki does an exceptional job of portraying the characters in this flick, giving an added dimension to Fujiko, Jigen, and the others that's sometimes forgotten in the excitement during other Lupin movies. Lupin himself is done especially nicely, doling out an extra-heaping measure of sympathy, elegance, and magic to a hero that's already Robin Hood, Indiana Jones, and James Bond all rolled into one. Yes, there's action, madcap antics, and highly improbable gadgets. But most of all, there's a great story underlying all of it that keeps you interested even after Lupin and the gang stop to rest and think out their next course of action. More plot twists than a topologist's licorice factory are present in this film, and the ending conveys a message regarding greed, power, and what's really valuable in this world without becoming cloying. Do you get the idea? This is a great, great movie, and the dubbed version is (amazingly enough) almost as good as the subbed versions. No matter who might be in the crowd, you can't go wrong with The Castle of Cagliostro. Recommended Audience: Cartoon-style violence: even though police and fights abound, the injuries are all (except one) implied rather than portrayed graphically. Unless there is some mild profanity in the dubbed version I missed, this should be good to go for just about anybody.